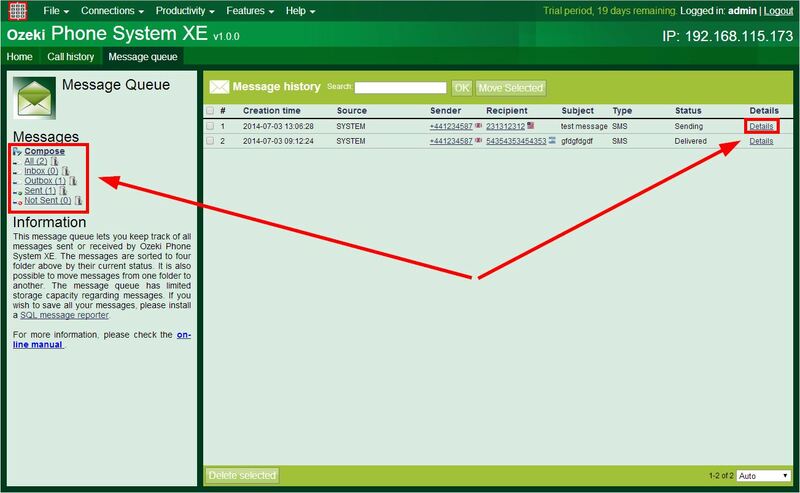 Ozeki Phone System XE uses central message processing which means that all the messages (as well as sent, received SMS, MMS, e-mail and voice messages, and even the delivery reports) go through a message queue in the system. By reading through the article below you can find out more on how the message handling works. The Ozeki Phone System XE is using central message processing which means that every message goes through a message queue in the system. The processing speed of the system depends on the capacity of the purchased software license. It is important the capacity of the purchased software license is applied not only to the received and sent messages but to the received delivery reports, too. One delivery report counts as one message. 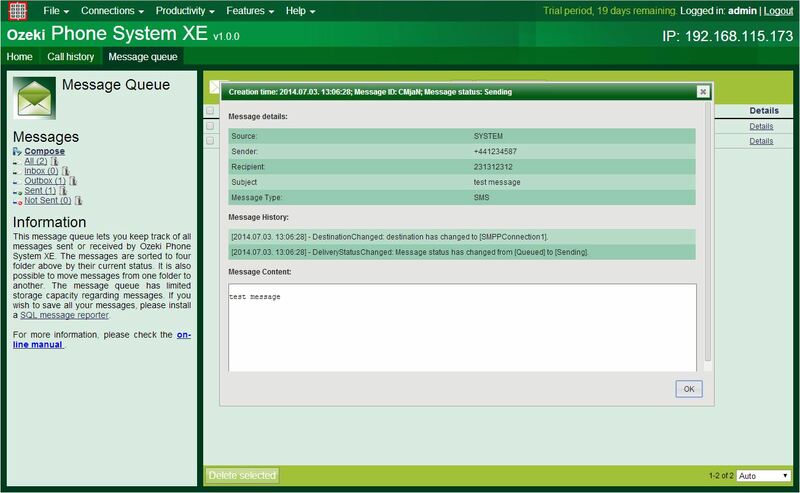 For example if you purchase an Ozeki Phone System XE software license with 10 MPM (Message Per Minute) capacity, it will be possible for you to send 5 messages and to receive 5 messages in a minute. The received messages can be for example 2 delivery reports and 3 received SMS messages or E-mails. Besides, you can customize separately the message processing capacity of each message sending component within the capacity of your software license. You can set that how many messages a given component should send or receive within the limit of the given software license (Figure 1). With this you can make priority among the different components. If you use the trial version of the Ozeki Phone System XE software product the text of every sixth message will be replaced with the following text: "Ozeki Phone System XE Trial - www.ozekiphone.com". 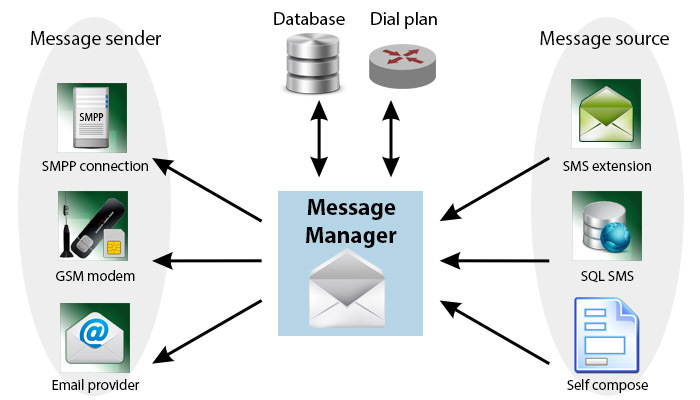 In the Ozeki Phone System XE the processing of the messages is based on the Round Robin principle, however a kind of priorty can be set among the messages because the processing capacity of each message sending components can be set separately. First the incoming messages are handled by the system and it goes through the components one after antoher. If the capacity of the software license is not fully utilized, then the sender componets will send messages or receive delivery reports according to the license capacity. After that the process starts again. If a given message handling component exceeds the capacity of the software license (or the limitation which was set at the given component) for example: concerning a 5 MPM software license the 6th message is sent to the SMS extension in the given minute, for the message the system will response with a Throttling Error. You can upgrade your software license to a higher capacity software license. You can find the message history under the Message queue menu item of the Features menu (Figure 3). Here it is possible to change the status of the messages with the Move Selected button. You can move the messages with "notsent" status into the outbox in order to send them again. You can also delete the messages. By clicking on the Details link in the message history regarding any message, you will receive a detailed routing history which includes that which outside line was the destination of the message (where the system routed the message), what kind of status changes the given message gone under (sent, not sent, delivered, etc.) and what kind of callbackID has been assigned to the message and so on. (Figure 4).